a person who produces paintings or drawings as a profession or hobby. a person who practices any of the various creative arts, such as a sculptor, novelist, poet, or filmmaker. a person skilled at a particular task or occupation. I haven’t posted on this blog as of late because I had no work to post. Have I been working? Yes, I have been working every single day. The problem (in my own mind) is that I haven’t been painting. What I am about to write is so absurd that I can’t believe it myself. I have been embarrassed to call myself an artist because of the work I have produced. There, I said it out loud. I have spent the last several weeks producing work for a show, a show that calls itself an “Artisan Walk”. Was I invited to be part of the show because I am a talent-less hack? Nope, I am just being me again and getting in my own way. I gave all of this a great deal of thought yesterday. Much of the thought was inspired by an outing with a dear friend on Sunday. This dear friend has a tendency to be highly critical of me, but when he saw what I have been producing he called me a genius. My discovery is this: I don’t dream of painting, but I have very magical and enchanting visions when I am awake. It involves fairies. That’s right, fairies. I have been making them for more than twenty years, and it has been my greatest financial success as an (dare I say it? ), artist. My second discovery or better yet realization is that as much as might dream of painting, I am more compelled by anything in my life to make children happy. I love creating enchanted worlds, of inspiring little ones to use their own imaginations, and to hopefully give them a moment of magic in a world that can be a very difficult place. I have loved the idea of fairies since childhood. At the last show I did I was approached by a woman much older than myself who was so excited by my work. She spoke to me of growing up in England near a forest. She and her sisters would play at the edge of the woods. Their mother would tell them tales of fairies, and leave them “fairy notes” tucked in tree trunks and flowers. While she was speaking to me her face took on a faraway look, as silly as it might seem in that moment she looked like a little girl again, lost in the memories of her youth. I may never produce the masterpiece that I thought I was supposed to do, and in the years after I am gone no one may see my work hanging in a museum, but I have no doubt that in the imagination of many children I have planted a seed that they will hopefully remember and pass on. If you happen to be in or near Fallbrook, CA on April 23rd, I will be at The Artisan Walk on Alvarado as part of the Fallbrook Avocado Festival. Stop by and say hello. I have wonderful memories of Chicago at Christmas, both from my own childhood, as well as my children’s. My favorite activity was always looking at the holiday windows of Marshall Field’s. There were other stores that had displays, but Field’s was always the best. We didn’t go down every year when I was a kid, but we did do it enough that I remember it well. With my own children I made it a yearly event. We would bundle up against the cold Chicago wind, and walk down State Street looking at the windows, hearing the Christmas Carols played overhead. Marvelous mechanical puppets moving on tracks working a little Holiday magic. Afterwards we would take the kids to the seventh floor to the Crystal Palace for ice cream. Yes, ice cream. Despite the cold and the wind, and often times snow, the day wasn’t complete without ice cream. The Crystal Palace was made to look like an old-time ice cream parlor. The hot fudge was delicious. (Recipe anyone?) Unfortunately, as it seems it is the way of the world these days, Marshall Field’s is gone. It is now Macy’s to the great horror of many of us who remember just how special a trip to Marshall Field’s was. The Crystal Palace is gone as well. I haven’t lived in Chicago for a little over ten years. I don’t know whether or not Macy’s has continued the tradition of the windows. I hope so. What led me down memory lane today? My fairies. 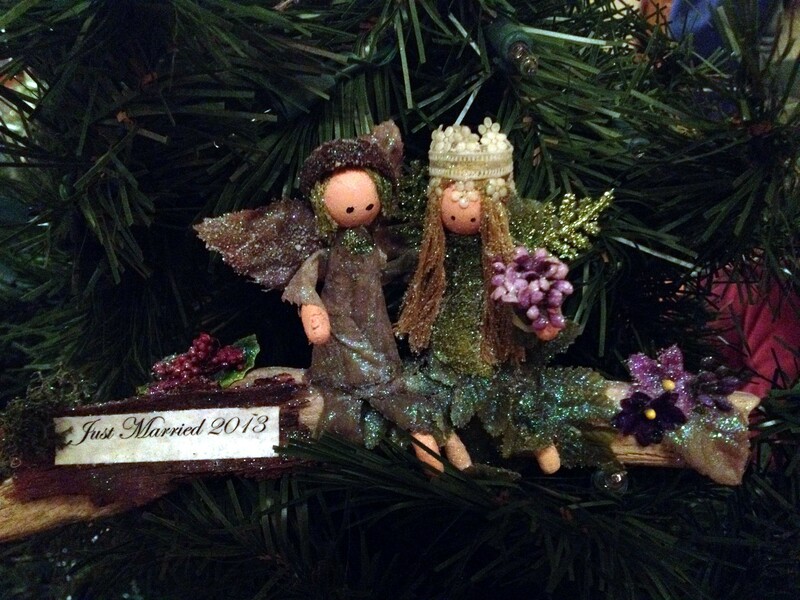 I know you are probably sick of them about now, but what started out as a fairly simple ornament many, many years ago, has evolved into art for me. I still make the ornaments, but they are much more elaborate than in the beginning. In the last few weeks as I’ve been creating them I have been taking them a step further. I’ve been creating little vignettes. The artist fairy with her branch easel, the teacher with the real tree bark chalkboard, the sewing fairy sitting on her spool of thread with her “toothpick needle”. Today I took it even further. I had two pieces of Manzanita wood branches. It’s a beautiful shrub or small tree, the branches are really interesting, twisted, gnarly, very sculptural. I actually purchased them to use in displaying the fairies a few years ago, but I never used them. I’ve been eying them for a few weeks now. I had an idea that came to fruition today. 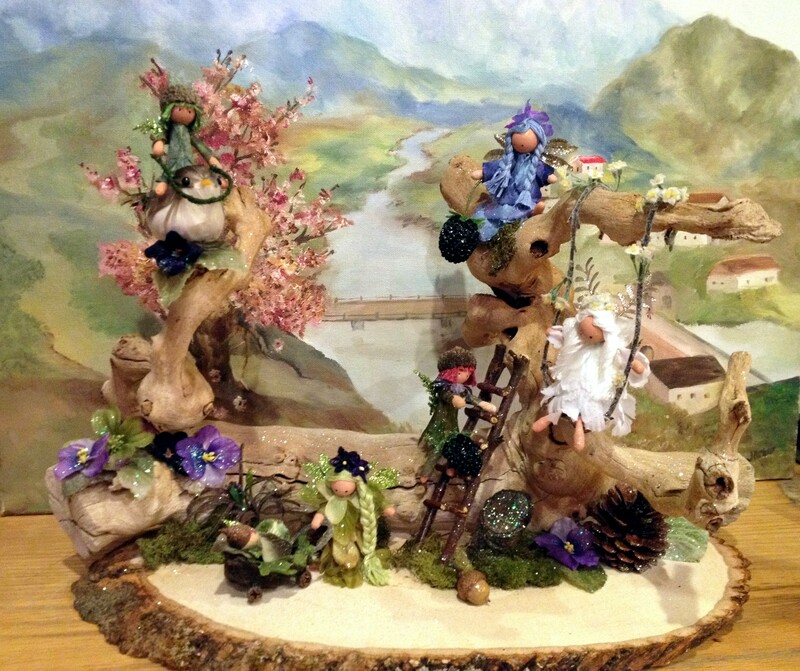 My “Fairy Playground”, a vignette of fairies at play. 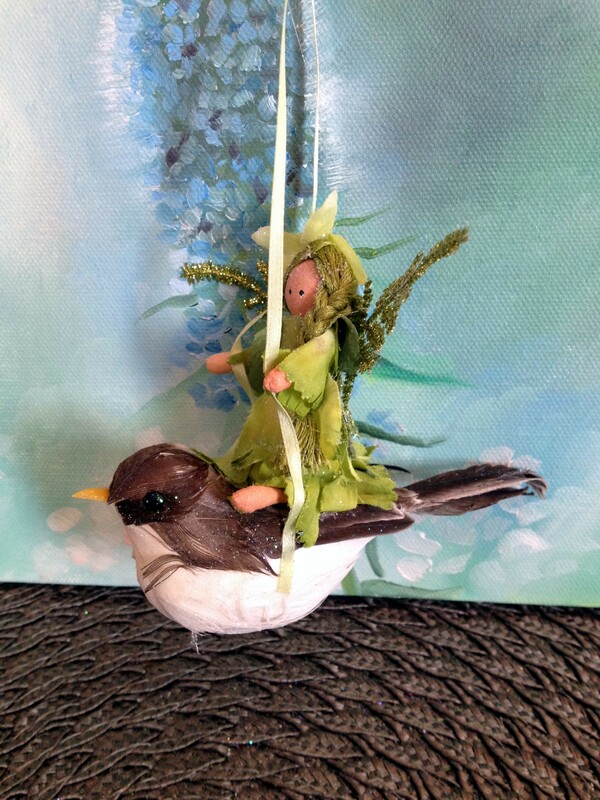 The elf riding the bird, the mother and her baby in his seed pod stroller, the white fairy on her swing of flowery vines, and the blue fairy and her elfin pal picking berries. I’m not sure if the pictures will convey just how enchanting it is. When I was finished and sat back to look at my handiwork I was reminded of Marshall Field’s marvelous windows. 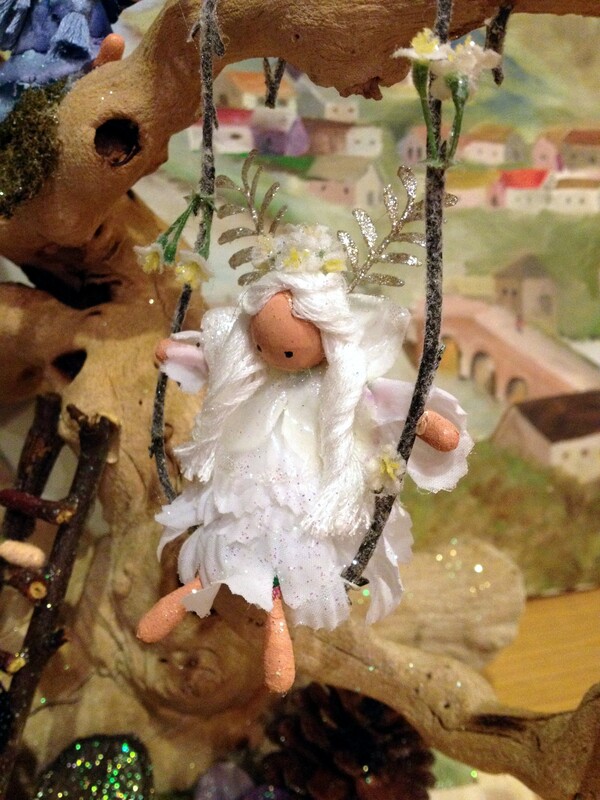 My elves and fairies don’t move, they aren’t puppets, but there is definitely something magical about them. The backdrop is my work, a painting I created when I was nineteen. So tonight again, fairies. Before I begin, I know I was stressing over not getting to my art because I was doing my other art, but I changed my mind today. 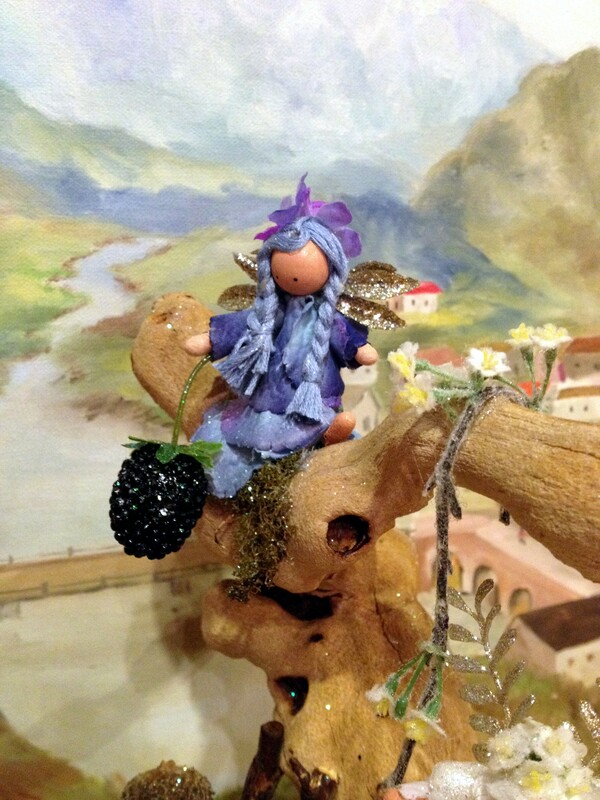 I didn’t stop my fairy making today in order to move on to my “fine art” because quite frankly I was having too much fun. There is a lot of tedious process in the making of my ornaments, and that sometimes can weigh on me, but today was great. That is because today I began to get creative. Of course the entire process is creative, but once I really get into making the fairies my imagination starts kick into overdrive. 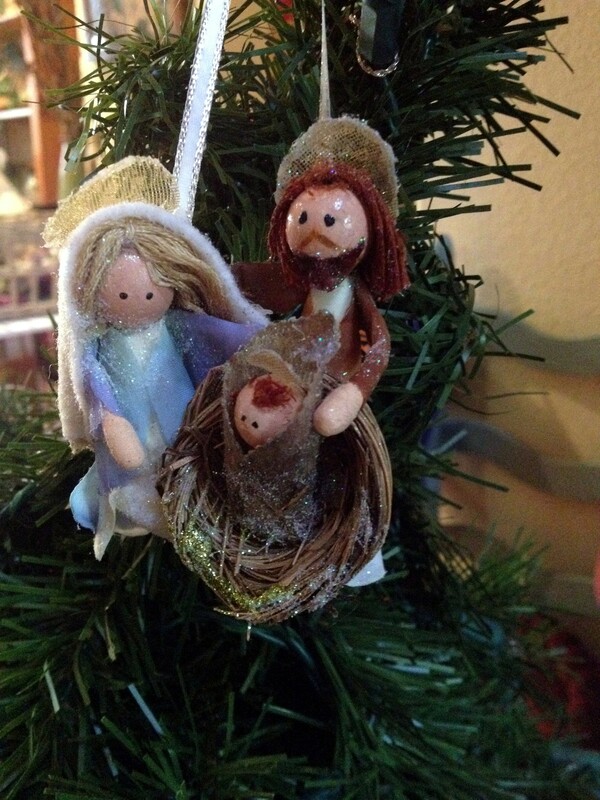 My friend Theresa requested a special order today, something religious…Hello Holy Family (check out the Baby Jesus, he has hair!) Then I began to look at my supplies and think of other ways to play with them. 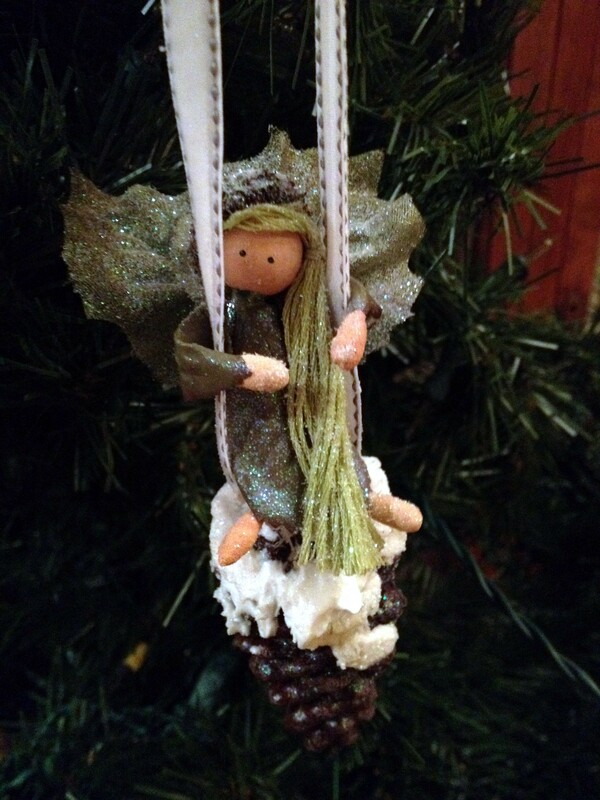 A fairy swinging on a snowy pine cone. A couple of newlywed fairies sharing a moment on a log. 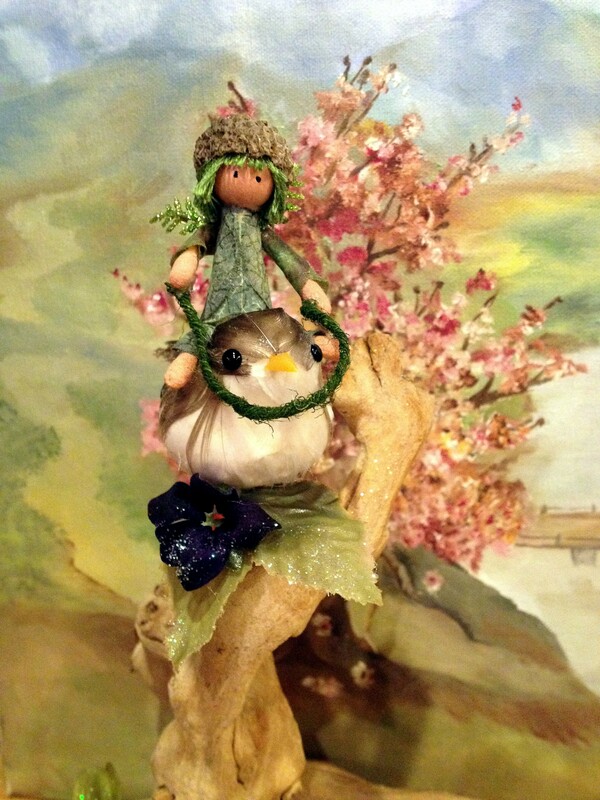 A fairy riding on the back of a bird. It’s only the beginning. I have more ideas swimming around in my head than I probably have time for. I’ll be back to my fine art tomorrow since I will be out of the house, therefore sans glue gun. I think I was in a funk and the monotony of what I was doing was getting to me a little, OK a lot. I’m sure in a few days from now, and a few back aches from now, I may feel like whining again, but I won’t. Time to gear up for that “holiday spirit” we are all supposed to have. I’m working on it. There may be a break in Dan’s search for the elusive job. We need lots of prayers and good karma sent our way. It’s been a long few months and I can’t think of a better way to kick off the holiday season than a little good news. I’m open to suggestion if anyone has any “fairy” ideas! Feel free to send them my way! Tonight I have a strange one. Jessica’s portrait is still too wet to touch, so I decided to begin work on another project. When I began the 365 project I had planned on focusing on finer art. Today’s project is more of a craft, but there are some crafts that are truly artistic. Earlier in the week I posted a photo of some fairy wings, and mentioned the fairies that I have sold so many of in the last several years. I have for some time wanted to take that project a little further. 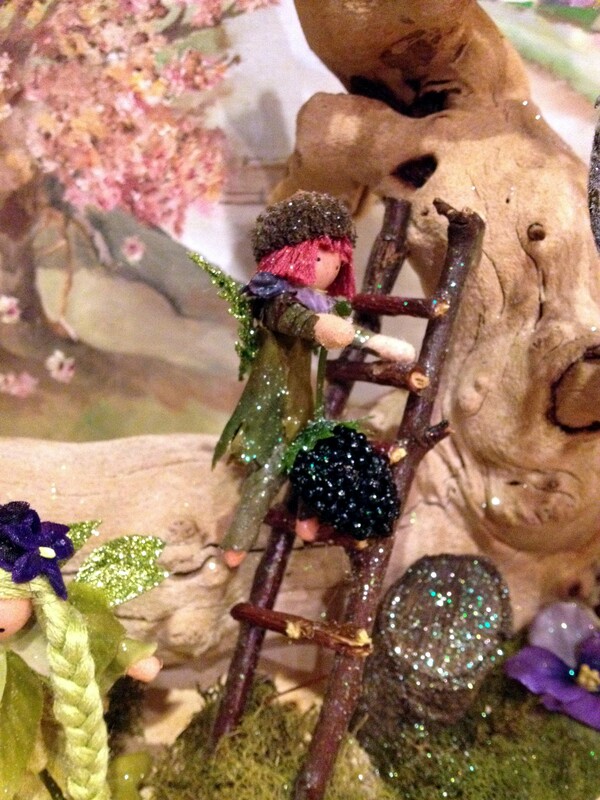 The fairies I create are painstaking, I spend so much time on the details of them with the exception of one thing. Their heads are wooden beads with a dot of an eye painted on them. They are truly beautiful, and people love them, but I want to make them more individual. 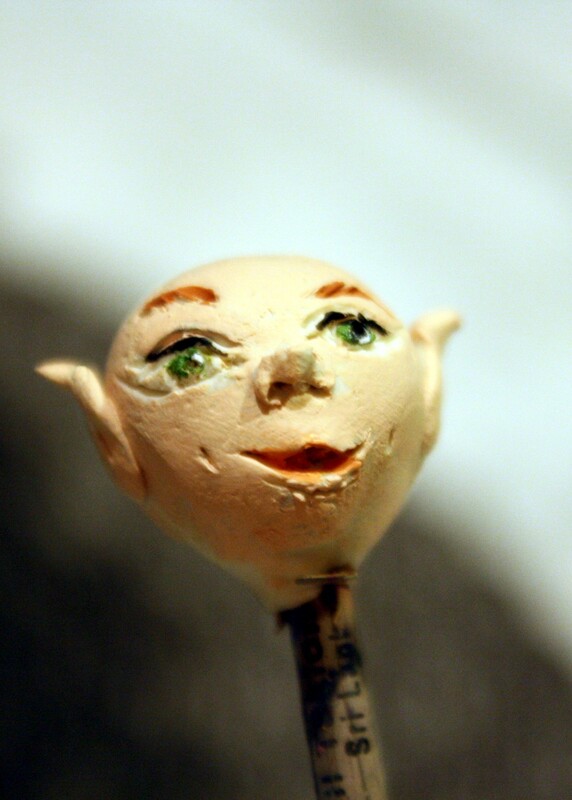 Today I sculpted some heads out of clay for the fairies. 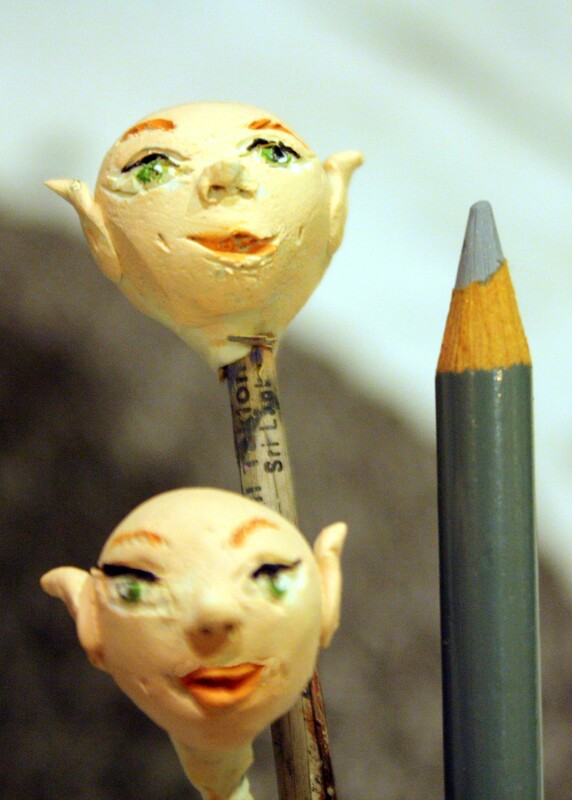 Sounds simple, but it was a pain in my….Anyway, I made them with Sculpy, baked them in my oven and then painted them. The paint needs some fine-tuning, I painted them in the dark in my garden (because I want to go blind), but they took me a couple of hours to create, and I am quite happy with their faces. I made two, one meant to be an elf, the other a fairy. The object is to make a mold of the faces so that I can reproduce them. It wouldn’t be cost-effective to individually make each face. 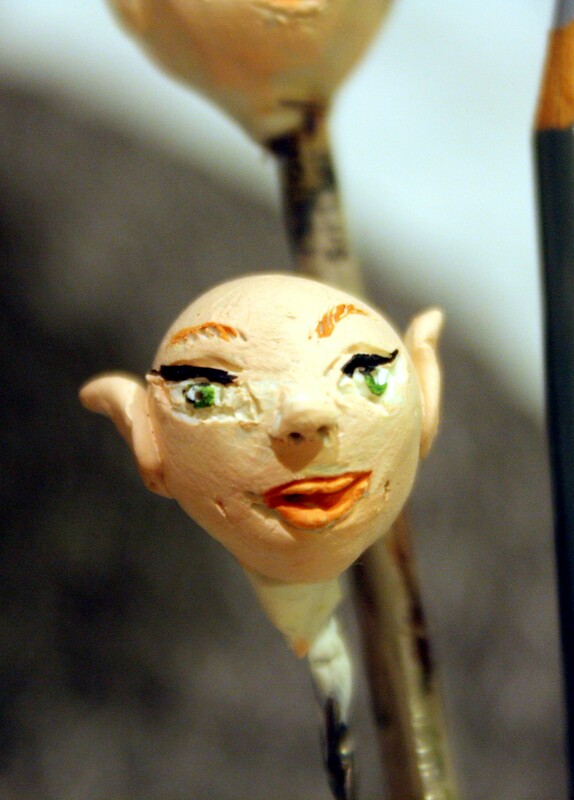 I would use a flesh-colored clay, and only have to add lip and eye color. If it works out as I hope, then I will possibly do a few different expressions. I may try to finish a fairy by tomorrow and post photos of old and new for comparison. While rereading what I have just written, I see that I am a little defensive about this project. I guess in a way I have a problem with the word “craft”. I have done so many of those church shows, and honestly never fit in. Not that there isn’t some good work at those shows, but I always thought I could be more than just a church show craft artist. I have had people approach me at shows to ask why I’m there, and tell me don’t belong there. I just never believed enough in myself to try for more. I’m beginning to change my opinion of myself. I do good work, craft show or not, and believe me it isn’t easy to sculpt a face as small as these. I photographed them next to a pencil for scale. I’m actually excited to see a finished one. Early post tonight. I actually did two small projects this morning, and then spent a lovely Memorial Day…cleaning the garage for six hours. I actually had planned to do something else, but quite frankly I’m exhausted. 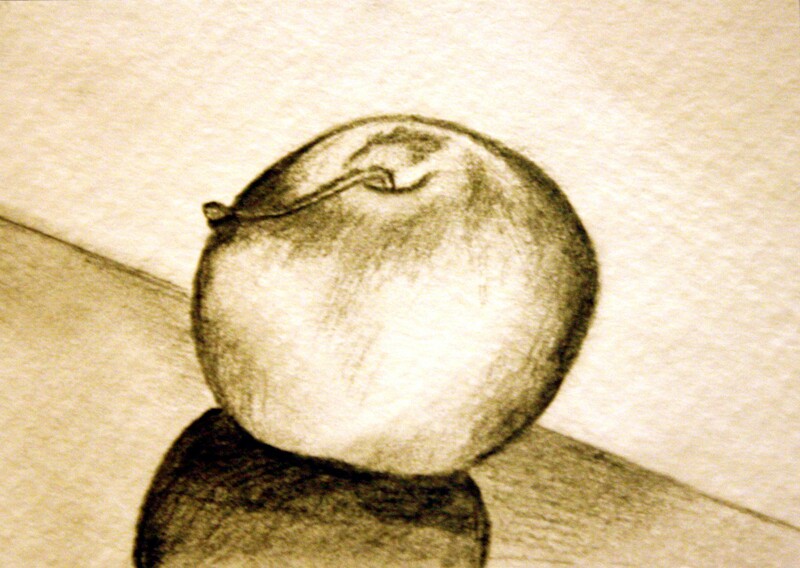 The first project is another artist card size drawing of an apple. It was a simple drawing exercise I gave myself to do. I need to work on shading and perspective. The other is also an artist card size, but for an entirely different project. 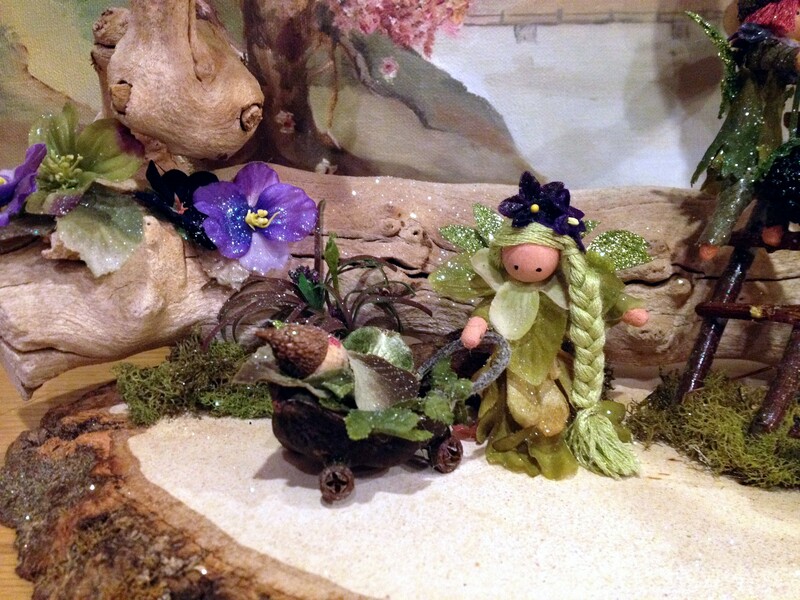 I have for years been making fairies. I’ve sold hundreds of them, usually around Christmas. I have decided to continue doing so this year, but have some ideas for making them even more artistic. 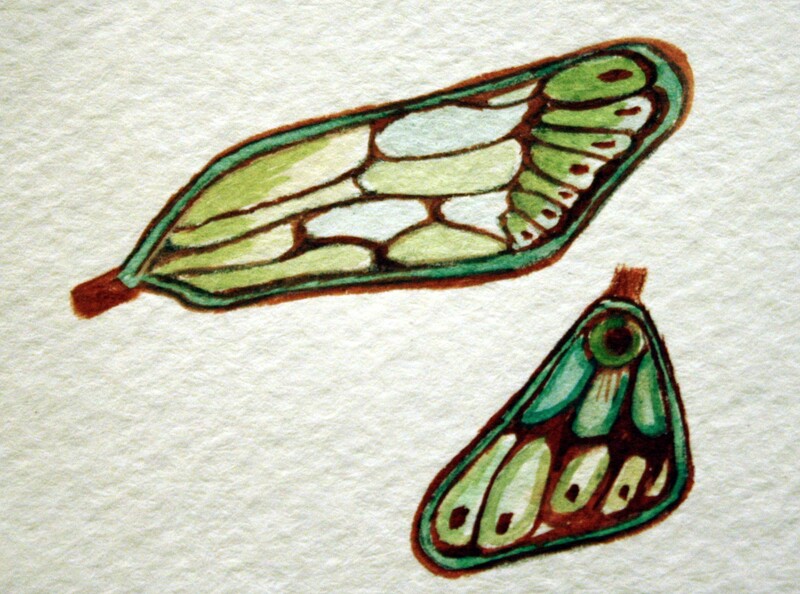 I designed some wings which I plan to print on vellum. 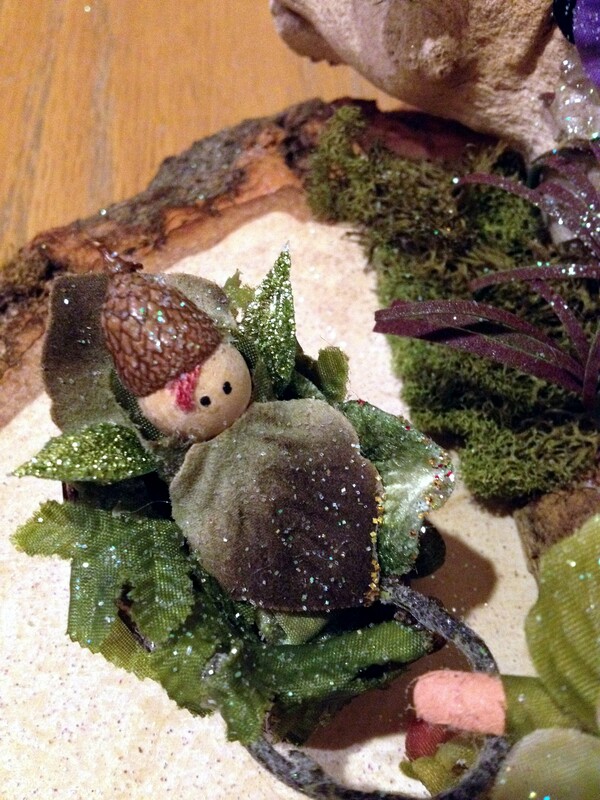 Once I have a finished fairy I’ll put up a photo. No philosophizing about my artistic life tonight, no “woe is me”, just a very tired woman who needs to relax.